Had a nice quiet day. Not done much. Had a cuddle with Flop, watched some TV, wrote a couple of postcards, sorted out some paperwork. I've been quite tired so I've just kept things low-key. This evening my muscle spasms have been quite bad and painful and I'm finding them frustrating as I can't control my own body. I feel last week, World FND Week, went well with my blog and I've been able to connect with a couple of other people with FND which has been really nice as before I knew no one an other than my neurologist I had no one to talk to who understood FND and even then my neurologist only understood it from a medical perspective so it's been nice to connect with other people who live with FND too and even though we're each unique with our FND we each 'get it' and can understand and relate to each other in different ways; in how FND has turned our life's upside down, the unpredictability and difficulty in dealing with relentless symptoms, the difficulty in getting treatment and being understood, the emotional impact and the loss of the life we had before and have to adjust to a new life with FND etc. Not done much today. Spent a while practising with my make-up. I wasn't going anywhere or seeing anyone but it just made me feel nice to put on something nice and do my make-up. I just need to find the energy to Shellac™ my nails at some point. Other than that I haven't really done much today. My batteries are running low, nothing new there, so I just tried to recharge them as much as possible. The M.E. 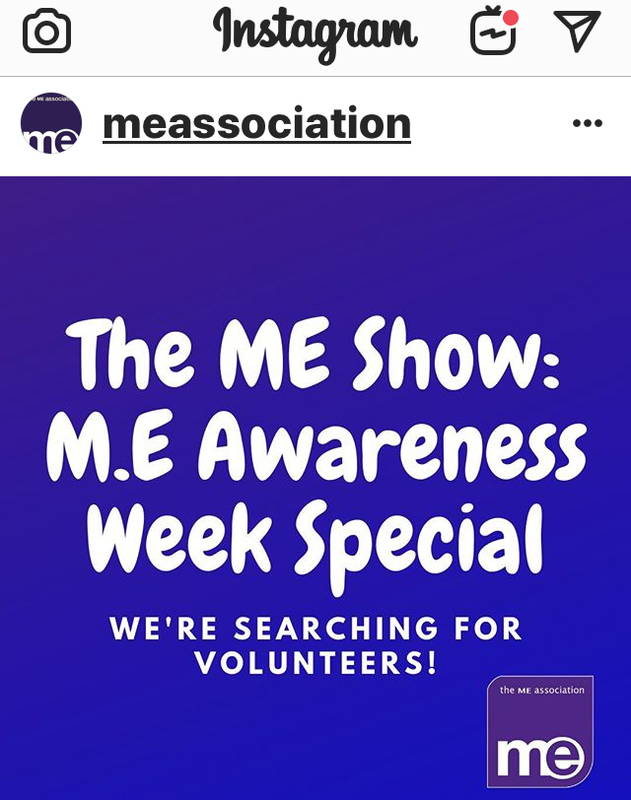 Association are looking for volunteers to contribute towards The M.E. show podcast so I made a blog post and tweeted it to try and get the word out and it's been nice to get positive feedback and get so many people like and retweeting my post. I also contributed my part. It was a voice record of 'This is the real M.E.' and talking briefly about your day-to-day life with M.E. It wasn't perfect so I might plan it better an resend it? This evening Mandy, Dad and I finished off watching 'The Victim' on BBC. Had a care plan update meeting with Dad and my nurse this morning. I did my make-up again today, nothing as fancy as yesterday but it felt nice. I rested for a bit and then this afternoon Dad washed my hair for me and then a bit later on Mandy, Dad and myself went to see Mandy's Dad and his partner Pam as it was his birthday and I like seeing Pam. I got back and was a bit tired so I just chilled out in the sunroom listening to a podcast. This evening we watched a really interesting programme on the BBC about 'The Earth from Space' and it was about satellite pictures of the earth from space. I'm now about to put on an audiobook and settle into bed which has nice clean sheets. Woke up with a fever and a sore threat around 6am so I just put on some Chicago Med and went back to sleep for a bit eventually and then woke up at my usual time. Did my usual morning routine and practised with my makeup. This afternoon I did a bit of art making postcards with my rush paint crystals. I'm slowing learning how to use them and trying out different techniques and ideas. Dad and I had some time together. We went out to the local garden centre. It was nice to get out the house. We looked at some plant ideas for my bedroom and had a wonder around. They had some birds of prey and I got to hold a barn owl called Dexter and stroke him; he was so soft!. Then we headed to the cafe and we had coffee and chatted. It was nice to have some Dad time whilst he's off work. With a migraine brewing and feeling flu like I was exhausted when we get back so I just got something to eat and laid on the sofa. Thankfully the Cyclizine (anti-sickness medication) and Sumatriptan (migraine medication) helped as did some diet coke (yep, that was recommended to me by my Dr). I'm now just about to settle down for the night, I'm just hoping that I sleep well. Woke up feeling yuck with a fever, sore throat and croaky voice, muscles hurting, eyes hurting, chesty mucus cough etc. I sat in bed with a cold and flu drink and watched an episode of Chicago Med. I've now managed to get myself dressed, downstairs, and I've had some breakfast and my medication and now I'm just resting on the sofa recharging. I'm just going to take it easy today. I do need to do a bit of college work but hopefully through the brain fog I can manage it if I just break it up page-by-page. Not sure if I'm feeling ill because of PEM from going out yesterday or whether I've just picked a bug up from somewhere as I don't have the best immune system? Woke up feeling awful. I was shaking all over and couldn't;t warm up and I had a fever and still had yesterday's symptoms. Dad and I was going to go to Louth Garden Centre today but Dad decided that I just needed to rest and we'll go next week. I've spent most of today in bed. Alternating between watching Chicago Med for a little while (I couldn't concentrate on watching a whole episode) and laying with my cooling eye mask - it has a gel insert that you put in the fridge and listing to podcasts and also falling asleep, usually by accident. I've also spent the day living off cold and flu drinks, and meds like anti-sickness and Sumatriptan as as well as dealing with the virus my body decided to throw in a migraine. Woke up feeling awful again; not helped by forgetting my night time meds. I took them and felt a bit more human by the afternoon. Unfortunately because I was feeling so dreadful I had to miss celebrating Easter at church. I spent most of the day in bed again like yesterday. April Is Irritable Bowel Syndrome (IBS) Awareness Month. If you’re reading this you may have not even known - I certainly haven’t seen it recognised in the way that it should be. I find that often people believe that just because an illness is common, that it can be easily controlled. Unfortunately, just because this illness is common, doesn’t necessarily mean it’s less debilitating. So, if you’ve heard of IBS, which you probably have - here are some things you probably don’t know about it. So, what is Irritable Bowel Syndrome? IBS is a chronic illness in which a patient may have a group of gastrointestinal symptoms, such as cramping, pains, nausea, indigestion, vomiting, diarrhoea and/or constipation, and much more. Patients typically receive an IBS diagnosis when other conditions are ruled out via endoscopy/colonoscopy. There are three versions of IBS, which are IBS-D (Diarrhea), IBS-M (Mixed), and IBS-C (Constipation). With IBS being so unpredictable, it is very possible that a patient can be diagnosed with one form that later escalates into the other. For example, when first diagnosed, I had IBS-D. Now I struggle Heavily with IBS-C. I was diagnosed with IBS when I was 17. 80% of people with IBS commonly have a condition called SIBO - an even bigger monster. I was diagnosed with SIBO (small intestinal bacterial overgrowth) in the spring of 2018, and nothing in my life has been quite the same since. Additionally, 50% of people living with IBS will be diagnosed with Fibromyalgia. I was diagnosed with Fibromyalgia in December of 2018. I often hear people say “it could be worse”. Believe me, I am so well aware of that. But, just because you can’t see this illness, doesn’t mean it’s not there. This is why I’d like to give you a general glimpse into my life with IBS. IBS is waking up each day not knowing how your stomach will react to the day. IBS is being horrified of eating certain foods because you’re never sure what your body will agree with, or how easily you’ll gain weight simply just from eating. It’s watching people eat whatever the hell they want and mourning the fact that you can’t do that anymore. It’s locating the bathroom in every single new place or building you go to. It’s having to bring your own food everywhere you go because it’s easier than letting someone know what you can’t eat. It’s trying to treat it’s comorbities, while also trying to find medications that won’t make your stomach go insane. It’s missing so many days of high school, college, and even work because your stomach has a mind of it’s own. It’s trying to eliminate as much stress, anxiety and depression in your life as possible, because it will make your IBS flare up - and even then it might flare up anyways. I never imagined that IBS and additional chronic illnesses would have such a huge impact on my life - especially at the age of 23, but here I am. Some days it seems like there is so much that this common, underrated illness has taken away from me, that I forget to remember how much it’s given me. IBS provided me a strength I didn’t even know I had. IBS reminded me to take care of myself, something I have struggled with my whole life - as I’ve always been really good at putting others first. Most of all, IBS showed me who the truest people in my life were, and gave me an online community of incredible people that understand me like no one else on this Earth. This month's Birchbox came with a lift up lid, mirror and magnetic closure. I'd already been thinking of combining some old empty Birchbox's to make myself a jewellery box but in receiving this month's box it was just perfect to add as the top compartment. Silky smooth baked powder to swipe over your cheekbones, brow bone and eyes to give off a soft glow. I've had this product before and I love it. It makes your skin feel ultra soft and smooth ready to apply your foundation and other makeup products. A pend of caffeine and diamond powder (yes, really!) to hydrate, de-puff and brighten your eyes. I'm feeling a bit ill today so when I went for a nap I put these on. They was nice and cooling. I left them on for longer than suggested. I did notice a difference when I took them off. Normally I have to put concealer under my eyes as they're a bit off colour but when I took them of I noticed the colour under my eyes was brighter and more blended with my skin tone and they looked less tired. They was really easy to use and apply. A nice little treat for my eyes. It's not something I'd probably buy myself as they're a bit expensive for just two eye pads but it was nice to try them out and give my eyes a a bit of TLC. A lightly whipped cream to nourish your body. A multitasking eye cream using chamomile, coconut, cucumber, rose hip and carrot oils to de-puff, brighten and soften and smooth the eyes. Or you can send me voice message via Facebook using the microphone symbol in Messenger or on the M.E. Association's Instagram. If you can help, I’d be most grateful, and am looking for a recording by Friday 19 April. It's been a typical FND week including a day spent in bed unable to move because I was in so much pain, plenty of seizures, naps, crawling and bum suffling around because my legs decided to play up and even a trip to A&E and that's not all of it! April is IBS Awareness Month. What is IBS to you? To me, as a Bowel Specialist Nurse, it's already about awareness. It's about breaking down barriers to poo related conversations. It's about acknowledging that everyone poos and that for up to 13 million people in the UK this can cause untold misery. Its about motivating people to get involved in research into IBS. IBS (Irritable Bowel Syndrome) is the name given to a chronic (longstanding) condition that affects the digestive system. Symptoms include constipation, diarrhoea (or both), abdominal discomfort and bloating. These symptoms can come and go and last for days, weeks or months at a time. In 2018, there were 392 research publications into IBS. This is a big increase but there is still a long way to go. For example there were nearly ten times that number (2,899) on Inflammatory Bowel Disease and over 5,000 on colorectal cancer. Research will develop better treatments for IBS. You can help by being involved. This could be by raising funds for a research charity, but the most important way is volunteering for trials. Remember that if you volunteer for a clinical trial you might get access to a new, more effective treatment but you could end up on the placebo; and even if you are on an active treatment which works, that treatment will stop when the trial is over. But by participating you are helping medical science move forward, bringing the chance of a licensed treatment closer. You can make an impact on research by signing up to ContactME-IBS. This is an NHS-owned national database of IBS patients wishing to know about research that they can volunteer for. Research is so important and a vital part of raising awareness of IBS so please spread the word! In September 2014, I had a migraine – I didn’t find it unusual because I generally got a migraine 3 or 4 times a year (they run in the family). I told my sister I had a migraine, took myself to bed and put a cold flannel on my head preparing to sleep it off… but this time, I knew something was different. My head was pounding, I felt very sick and I tried to get out of bed to rush to the bathroom only to find my legs weren’t working. I flopped onto the floor. Scared and panicking, I tried to call out for my sister, but my words came out as weird sounds and grunts. At this point I started crying out and screaming whilst trying to pull my body in the direction of the bathroom, heaving the whole time. My sister heard me, saw I was about to be sick, and honest to God she turned into super woman. She’s 14 months younger than me (and is now a qualified nurse – so that says a lot about her character) she was just as terrified by what was going on, but she dragged me to the bathroom and called my parents immediately. It was on the flood of the bathroom where my body started to cramp and contort. I could feel my legs, but couldn’t move them, my arms twisted up in cramp, and my face dropped on the right side. I thought I was having a stroke, and so did my sister. She dialled 999 and my parents got home shortly before the ambulance arrived. They were shocked by what they were seeing, as anyone would be; I was fine before they left to go for a meal with friends. The ambulance arrived, and they weren’t sure what they were seeing, but concerned I was having a stroke, they got me in a stair chair, then loaded me into the ambulance. 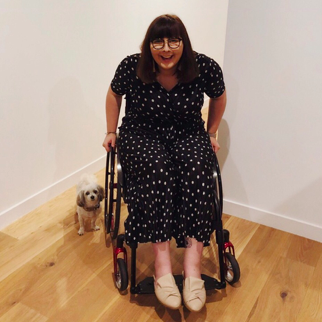 I was taken to A&E where I was constantly asked how much I’d had to drink, and judged when I couldn’t talk to answer questions or uncramp my twisted arms when they wanted to take blood. Eventually when they believed I wasn’t paralytic, I was sent for a CT, things such as aneurism and tumour on the brain being thrown around. If I was scared before, I was bricking it at that point. I remember going home feeling a combination of things: relieved I didn’t have a brain tumor, embarrassed about making a big deal out of what seemed to be nothing, confused about what had just happened to my body, scared that it would happen again, and disappointed in the A&E staff. I don’t remember getting home, or getting in the house. I just woke up the following afternoon on the sofa. That was the first time… just over 4 weeks later it happened again… then 2 weeks later it happened again… every week for 3 or so weeks I was having these attacks calling an ambulance every time and being sent home where my dad wheeled me around on an office chair to get me back into the house. It was starting to happen every few days, and then every day. I wasn’t. Mostly because she’d just told me there wasn’t any treatment, and that she was going to send me away from the hospital with an address for a website… I mean, come on… At the time I thought I would rather have a tumour or a bleed on the brain, because those things can be operated on or removed and then they’re gone. This… All I had to cope with severe cramping, migraines, loss of speech, loss of movement in my limbs, all I had was a website, an office chair to be dragged around on, and three jobs I could no longer do. Stress (this is a big one). 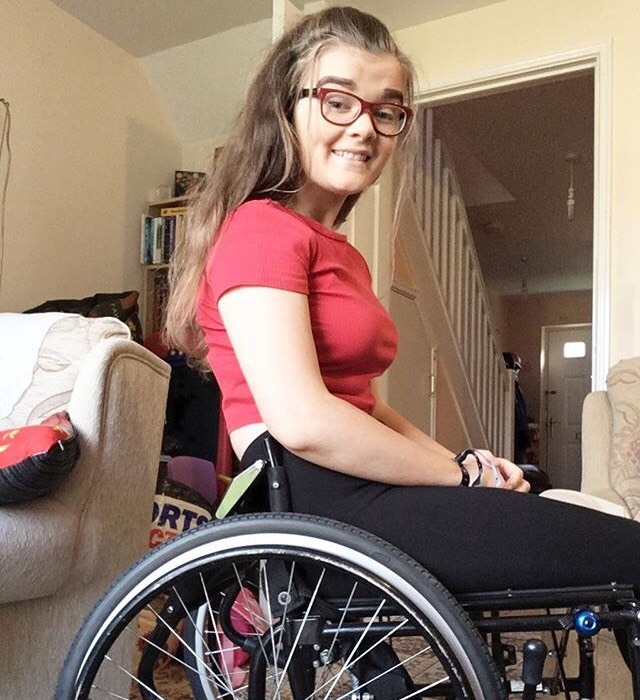 Knowing when I need to stop walking/wheeling (when I’m about to over-do it). Managing what I’m doing – so if I know I’m going to be busy on a certain day (a family event, friends gathering, day out, that sort of thing) I won’t to anything for a couple of days before and a couple of days after. Not doing anything involves comfy clothes combined with gaming or crocheting or binge watching tv. My period is a massive trigger, so tracking them and knowing when I’m due on is very important. That way I know not to do much around that time as I’m likely to be more susceptible to all my triggers. Twitching and jerking of arms and legs, sometimes a neck twitch. Speech is affected – I know what I want to say, but can’t get the words out, I just make strange noises. This is less frequent now, but used to happen on a daily basis. I would use google translate to type things in and get the google lady to say them out loud in order to communicate. All in all, my life has been turned upside down in a short space if time, and it's the same for many others suffering with FND. And just like any chronic illness, if affects the people closet to you as well, mostly your family. My mum is now my carer and my sisters adopt that role too when I need extra help. It's because of all of this that I decided to start up my own Instagram page where I would share my story, experiences and coping mechanisms as well as my achievements and a little bit of positivity. I always say, if you don't laugh you cry, so I'm hoping that one of my posts might reassure someone or even cheer them up. Basically just trying to do my bit within the FND community. I am taking part in the Rollerthon with my friends and family on the 12th of May to help raise awareness for FND, and funds for FND Hope UK. I will be posting updates on the day. If you can't donate anything at the moment, it would be amazing if you could share the link and my story on social media in order to help raise awareness for FND! Not the best start to the week. Had may carer this morning and I had one short tonic-clonic seizure. A little later one I went into a prolonged seizure and the paramedics where called out. I wanted to avoid A&E as much as possible so they did what they could but my myoclonic seizure where still pretty bad. I didn't;t really feel like the paramedics listens to me when I was trying to explain to them what care works for me and how my illnesses affect me. They kept trying to compare me to "normal" people, for example with the way my body metabolises medication what might take the average person 2 minutes for a medication to work it takes my body 20 minutes. My carer stayed as long as she could but had to go to her next customer so another carer came o take over. One thing I love about Bluebird is even in emergency situations they still try and get a familiar carer to your care team out to you so one of my 'backup' carers came to take over until Mandy got home so I wasn't alone still having my seizures. Sometimes it's the smaller things that make the biggest difference, like someone making a coffee and holding the cup so I could drink because I can do that or feeding me a sandwich. It's hard to had someone do that for you in your 20's but I'm treated with such dignity and respect and humanness. Despite everything that one on this evening I've managed to get the college work that I aimed to do done and I've put together a couple more letter which mandy is going to post for me tomorrow. Super bad night's sleep again. I was in a lot of pain though I managed to get some sleep eventually. As something to do I coloured in a card and envelope to send to a friend. I just had a quite day in the house. I had my carer for ½ and hour this afternoon and then at 3pm I had a visit at home. I had a meeting in the morning at home. Not having the best of days. I've tried to do lots of self-care and I settled myself in bed and had a nap and watched a film. Not had the best time with my seizures this week. i don't think being unwell and having an infection is helping. Had my carer for a couple of hours today. I've had my favourite carer this week and we get on really well but she's still really professional and I've put it to Bluebird to nominate her as carer of the month. Action for M.E. have asked me to make a short video about 'M.E. and Me' so I got round to doing that this afternoon and I learnt a lot about how to edit videos so that should help me to try and make more videos for my YouTube channel. I had an early night and settled down in bed with a film. Woke up okay. Still feeling unwell and having sharp chest pain and difficulty swelling which I've been having since the early hours of Wednesday. Today I've watched some TV, done some of my distance learning work and done some tidying in my room. I've also cleaned Flop out with Mandy's help and I had a little cuddle with him and he was very chatty. This evening it was just Dad and me so we watched some TV together. My myoclonic seizures have been flaring up so I've settled in bed early and I'm just going to watch 'Glow Up' on BBC iPlayer which I'm really into and Dad's just brought me a herbal tea. Forgot to write today, oops! Today I didn't;t feel well at all so it was a day in bed watching Chicago Med. I hardly slept at all last night so I don't think that helped. I've been in a lot of pain today. Emotionally I've been struggling too and because of my tiredness and pain I've found it hard to distract myself. Tuesday: opening a card that I'd coloured in, the picture has butterflies on it. "Hi, erm, today is Saturday and the time is 12.18. Right, where do I begin, (hmm)? I've been asked to do a blog on FND - Function Neurology Disorder. At the moment life just seems to be one great big struggle for me. Erm, I've been struggling since middle of February with this ear infection. All I keep hearing is like, like an aeroplane sound in my ear. Err, whether the FND is playing around with it as well, I don't know but it's leading me to have a lot of seizures. Erm, it's just making me feel really poorly at the minute. Erm, it really is. I'm struggling to hear; I'm just feeling really really weak. I've not got a lot of strength about me, at all. Erm, my seizures when they happen I can be fine one minute; next minute I'm just like in another world. It's really strange. Erm, my lad and my husband will just like look at each other and go like 'here she goes again', but not in a horrible way. It's kind of 'here she goes'; knowing that they noice the triggers. Erm, they notice because my voice is actually changed; they notice because they notice my shakes; they notice that, I can't say a normal word right. Erm, I'm concentrating on my favourite things right now and I'm concentrating towards my happy place but even that isn't helping. Now, somebody has told me 'concentrate on a happy place'. Now, I do my best and I try my breathing exercises as well. Thing is, what do you do when you feel like your seizures are coming on and the more that you try, the more you know that your body is just taking over. I have my music that I can put on. Erm, I have like a selection and I do try my hardest to kind of like sing along to it in a way. But (sigh) I haven't really got a clue what's going on; I really don't. Erm, (sigh) I just wish there was some way out of suffering this, I really do. Sorry I don't sound positive at the minute, but it's all just dragging me down. I just want to be better, but I just don't know how. I really don't know how. Sorry it's not a positive blog. Thanks guys." For me, living with chronic fatigue (CFS) is like living with a huge question mark over my head 24/7 and never knowing when it’s going to drop and everything will fall apart. Will the amount of sleep I got last night be enough? Will I be able to sleep? Will I wake up with enough energy for the day? Will I have enough energy to eat enough? Will I have enough energy to make it to my appointments? Will I have enough energy to leave the house? Will I have enough energy to do something fun? Will I have enough energy to study? Will I have enough energy to get dressed? Will doing that one extra thing outside of my routine put me in a flare? Will that different environment put me in a flare? Will that sound put me in a flare? Will that light put me in a flare? Will that vibration put me in a flare? Will that smell put me in a flare? SO MANY QUESTIONS. EVERY HOUR OF EVERY DAY. CFS is different for everyone. 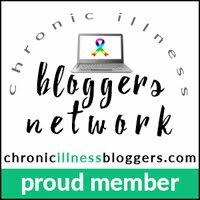 My CFS is comorbidity of a neurological disorder. I guess I’m fortunate in that my CFS is not severe as some people in the CFS community. I study full-time at university (online), I go to gym twice a week (most weeks), I go to hydrotherapy and physio once a week for rehab for my neurological disorder and sometimes I still manage to do things for fun. BUT it has taken me over a year of education, pacing and trial and error for my body to be able to even tolerate my daily life and not have constant flares. There is a list of things as long as my arm of things I can’t do that every other person my age likely does because I live with all the above questions every single day. I have to control and weigh-up every single action I do every single day to ensure that I don’t push myself and stop functioning. I have to wear sunglasses whenever I’m outside and ear plugs whenever I go to the movies or a concert. With CFS, you never know how much fuel you have left in your tank. You’re constantly running on empty but you never know when it will run out each day or if it will run out. When my CFS flares, it might be debilitating and what little life I have goes out the window. You’ll find me lying on the lounge, too fatigued to keep my eyes open, just literally surviving minute by minute until it’s time to go to bed. Unable to do anything other than eat a few times a day (someone prepares my meals) and go to the bathroom a few times a day (I am already a full-time wheelchair user from my neurological disorder). That’s it and that might be my life for a day, for a week, for a month or maybe even for a year. The flare might not be as debilitating and I might just have to cancel an appointment and have a day on the lounge to recoup. I don’t know how bad my flare will be, how long my flare will last and sometimes I don’t even know what caused my flare. That uncertainty is devastating. That uncertainty is CFS. The constant planning, evaluating, accommodating and weighing-up is CFS. “If I go to gym today, that means I’ll need tomorrow to rest so I can’t schedule anything because I don’t want to go into a flare.” “If I go grocery shopping I won’t have enough energy to study later because I don’t want to go into a flare.” “I have that assignment due this week, I can’t schedule any appointments because I don’t want to go into a flare.” “I need to go to bed early because I watched that video that had funny lights which caused me to have a headache and I don’t want to go into a flare.” “I’m too brain-fogged today to study, I’ll have to defer that exam because I don’t want to go into a flare.” No one knows what I have to go through in my head each day because of my CFS. That in itself is draining and frustrating that you can’t just live your life how you did only two years ago. Friends leave you because they don’t understand or don’t care. Family that don’t live with you don’t understand INVISIBLE illnesses. CFS is such a lonely condition. You are isolated because you can’t interact with the outside world like an abled person and society is not disability inclusive as it needs to be. Luckily, I discovered the online community and I don’t know if I’d be where I am today without it. The comfort of knowing that there are people all around the world that have lived what I have lived and can understand is invaluable and I’ve been given opportunities to advocate for myself and others that I wouldn’t otherwise have. My hope is that this small insight into my life with CFS can help just one other person or change one other person’s perception of CFS. I have daily seizures, some days are better than others. I have a mixture of tonic-clonic seizures which are your classic unconscious convulsions. I then have myoclonic seizures which are involuntary jerks; these are usually in my right arm and because of my hypermobilty it can cause me to sublux or dislocate my shoulder, sometimes the force has even knocked me backwards. Sometimes I get the myoclonic seizures in my whole body. I also have absence seizures which are brief losses of consciousness and they just look like day dreaming moments. After a seizure I become what is referred to as 'postictal' which is the altered state of consciousness post seizure. Sometime this can last anywhere from a few minutes to several hours. In this time I'm confused, I have speech difficulties, disorientated, and I can experience nausea and develop a headache or a migraine. Post tonic-clonic seizure I am very weak and I need help with simple tasks like walking, drinking, taking medication etc. I can also go into rigid muscle spasm which is very painful. I can sometimes go into what is referred to as 'status seizures'. or me this presents as an unconscious state of back-to-back tonic-clonic and myoclonic seizures which can last for quite some time and I usually need medication to bring me out of these episodes. My mobility is also affected due to sensory disternbances in my legs. 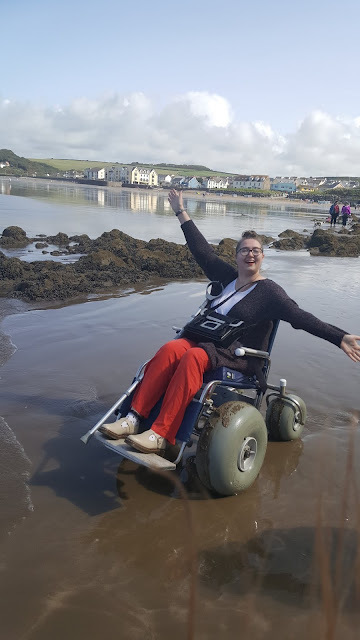 Basically the messages between my legs and my brain get scrambled so walking or moving can be difficult as each step is a conscious effort so I can all off-balence and it very tiring and painful so outdoors I use a wheelchair. I also use crutches. Sometimes those messages can also cause me to get numbness in my body, usually either in my legs or down the right side of my body. I also get pin-and-needles pain in my legs which can affect my mobility. I have regular falls because my legs just give way. I've forgotten what it's like not to be in pain if I'm honest. Somedays I can just get on with my day, others days I'm in bed crying trying to distract myself. I have all sorts of pain - nerve pain, joint pain, muscle pain etc. Sometimes it's localised to a specific area like abdominal pain or in my hips; other times it's generalised all-over pain. Chronic pain is a symptom of my other illnesses. The problem with FND is that the pain is that the pain signals can remain switched on in the brain so I might dislocate my knee but even when it's sorted in my brain the pain signals remain on and this can last for days, weeks, months and even years. Again this is another illness that features across my other illnesses and it's another major symptom for me. Brain fog is like your brain working really slow and you struggle to remember and process things. It's like if someone throws a ball at you it's going to hit you; you can see where you're looking at them but you don't know that they threw the ball til after it hits you. It's also like being drunk , like really really drunk (without the alcohol) and you have slurred speech and you forget words and get things mixed up. As well as the brain fog I get confused a lot, or example I'll pick up a fork instead of a spoon and I struggle to follow instructions and I lack the concetration and I struggle to focus such as on conversations or in TV programmes. I'm very forgetful, I get tired, I also find it hard to complete tasks. My speech is also affected. I often forget words or I confuse words and mix words up. I also utter and stammer on words - sometimes this is post seizure and other times it can common randomly. Another really embarrassing symptoms for me as a young person is bladder issues. I have incontinence and a leaky bladder, partly this is because the brain signals between my bladder and brain don't work and my HSD also doesn't help. I have urinary urgency as my brain does't get told it's full until it's really full so wen I need a week I NEED a wee! But because of my poor mobility often I can't get to the toilet in time so I have to wear incontinence pads. As well as this I also go into urine retention. I have frequent infection including UTI's. I also have digestive issues again because my brain and digestive stutter don't "communicate" well with each other. Like with my other symptoms above they cross over a lot with my other illnesses. 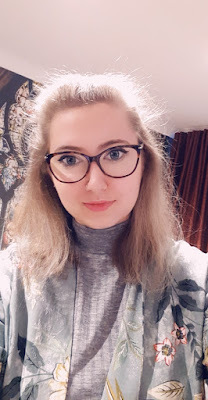 I have chronic fatigue, vision problems - especially double vision, hypersensitive (especially to light so I wear tinted lenses and noise is difficult and strong smells; this is partly because my brain finds it harder to process sensory input). I also have major sleep problems, headaches and migraines. I also get a strange sensory disturbance whereby parts of my body feel smaller or bigger than they really are which is really odd and scary. FND is really unpredictable illness to live with. I can't predict even one minute to the next. One moment I can be fine an the next I could be on the floor or unconscious having a seizure. I can find myself going into spasm unable to self medicate or hold a cup or be unable to communicate or be curled up in a ball crying in pain. Targeted treatments for FND in the UK are few and far between. Treatments for FND include medication, occupational therapy, physiotherapy and psychology. I personally and am hoping to get funding to go to inpatient rehabilitation. My fight for funding for a care package continues. As a result of my symptoms I find basic day-to-day tasks difficult to do, for example personal care, self medicating, preparing food, drinking etc. I feel very lucky to be under the care of Professor Edwards in London who is highly regarded in the FND community and his understanding of FND is amazing and he is very understanding, supportive and sympathetic.